January’s camp run with Wildcraft Australia was so much fun we’re already looking forwarding to next time! It was great to have families staying in the lodge over the course of the week, all getting in on the action, making new friends and enjoying all the wonders Wangat has to offer. Full details of our April camp can be found on our Family Camp page. Chris will be back once again this March with his drums and seemingly unstoppable energy! Join him for a fun-filled weekend of drumming, dancing and connecting rhythm with nature in the beautiful Wangat surrounds. Chris’s program includes a series of facilitated drumming playshops learning African drum rhythms on the djembe plus a powerful session learning bass rhythms on the dun duns! For both beginners and intermediate drummers. There will be guided bushwalks with our very own Dan, time for personal meditation, opportunity to swim in the beautiful Chichester River as well as the fantastic Fire Circle on Saturday night! Earlybird rate $250 - book now! We’ll be parting back the ferns and opening our doors to the public this Sunday as part of seeDUNGOG! During our ‘walk and talk’ tours you will explore our beautiful forest property, hear about projects we have on the go and gain insight into our vision for Wangat’s future. There will be 2 tours commencing at 10am and 2pm. All welcome! As the tour will explore our forest paths, we advise wearing appropriate walking shoes. Bring your kids to Wangat this October for a wild day of nature-based activity and fun! Facilitated by experienced guides, activities will explore the beautiful rainforest, rivers and creeks of Wangat and its surrounds and teach children about the natural environment and bush crafts. Activities will include finding fungi, discovering birds and other wildlife, cooking damper on the fire, navigating a treasure hunt, building a forest adventure playground and more! Participants can come just for the day or stay at Wangat with their family and friends in our affordable accommodation; the lodge can be booked ‘hostel-style’ during the holiday weekdays or stay in one of our self-contained bush cottages (availability permitting). Activity days will be held on the 3rd + 4th October only this holiday. 9.30am - 3.30pm. For children aged 7+ (younger children may be permitted on discussion with parents). Self-catered lodge accommodation offered at $35 per adult, $20 per child /night with shared use of lodge facilities. Alternatively you may wish to book one of our 2 self-contained cottages (limited availability). Do you want to learn more about your own voice and understand it’s strengths? Have you ever wanted to sing in public but haven’t had the opportunity or confidence? Have you had some experience singing and would like to hone your skills further? 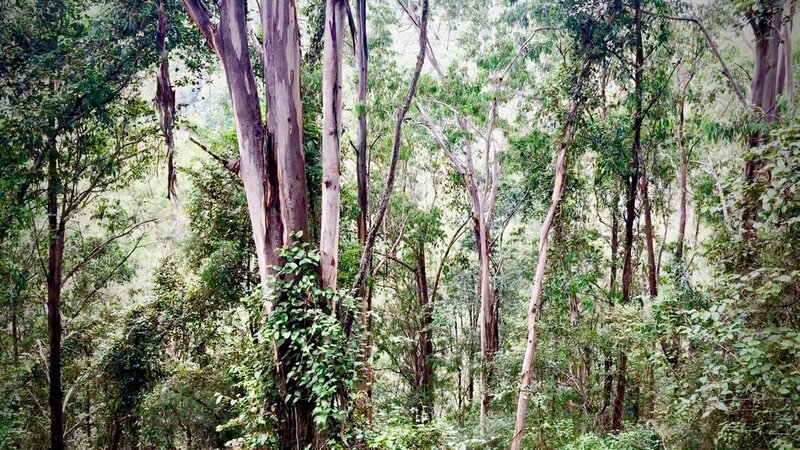 Join reknowned Sydney singer Alexi Kaye in a singing workshop this September in the remote and tranquil forest at Wangat Lodge. Get to know more about the strengths of your voice, learn what your voice is capable of and practice performing in front of your peers in a supportive, relaxed environment whilst having the experience of truly 'getting away from it all' in Wangat's unique environment. Each participant will have individual singing sessions as well as partake in group singing sessions with dedicated time for improvisation. Interest in singing as well as some minimal singing experience is required. Alexi Kaye has done all the bits and pieces you’d expect of a singer whose career has spanned more than 25 years. From touring extensively across Australia with two different original bands, performing live on TV with her vocal group KAYA and on ABC radio in many Australian towns including Richard Glovers drive show in Sydney to winning best Blues Artist Award with her band EXTENDED FAMILY. She has played at weddings, funerals, concert halls, music festivals, pubs and private shows. She’s recorded albums (2 of her own, 5 with bands) and also appeared as a special guest on many others. Over the past 11 years she has taught singing one-on-one and with groups both privately as well as in schools. She has a music degree (honors) and a DipEd majoring in both instrumental (voice) and classroom music and is currently taking a community choir in Melbourne. Food, by Verity – the Wangat Way! Home-made, wholesome, ethical, mostly vegetarian, plentiful and DELICIOUS! 10 bunk style rooms with 2, 4 or 6 beds in each and two self-contained cottages. Families/friend groups can book a room or individuals can book a bed. CircleofDrums returns this September for another weekend of drumming, dancing, singing and community spirit! Through learning and practicing ancient wild crafts (making fire from friction, animal mimicry, interpreting bird calls, navigation by natural elements, rope making and weaving from natural grasses, barefoot walking by day and night, etc.) and the incorporation of traditional village practices (group processes, storytelling, camp fire cooking, sharing, singing, dancing etc.) there is a tangible surge in connection to nature, self and others. The aim is that the experiences enrich you and will subsequently inspire your own private and professional practices. Developing your own connection to nature improves you own ability to connect others to the healing power of nature. Let’s face it – in adventure therapy, it is the wildness of nature that helps bring the healing. The camp will be held in the simple and comfortable accommodation of Wangat Lodge, nestled in the sub-tropical foothills of the Barrington Tops within pristine forests and on the stunning Chichester River with its deep swimming holes and rapids to explore. Wangat Lodge is managed as a wildlife sanctuary and conservation area and is rich in wildlife and incredible bio-diversity. It has a large indoor community space and outdoor communal fire pit. All food for meals is provided. Nikki has spent much of the last 10 years learning traditional bush skills from Indigenous people all around the world. This included spending a year living in the bush, learning and practicing these skills including building her own shelter using hand tools, traditional methods and natural materials. This, on top of working in the outdoors as an outdoors guide, bush regenerator, youth team leader and also following the work of nature connection facilitators, has left her with a passion for sharing the skills as she sees that when we rely on nature to provide our needs, we naturally become connected to it, we naturally want to look after it and we naturally find our place in the world. Dan is a NSW representative for AABAT. For the past 20 years he has worked with youth-at-risk in wilderness settings, running programmes of Bush Adventure Therapy. He has also taught Outdoor Education at Western Sydney University and at various schools. At present, he is co-owner with his wife Verity of Wangat Lodge where they offer accommodation, outdoor education and BAT programmes. He is a passionate adventurer, often putting himself at his edge in nature for personal growth and awareness. He really looks forward to hosting participants at the “Wild Village Experience”. Dan is an historian, youth worker, adventure guide, bird watcher and loves living in the little shire of Dungog. Mahli grew up in the urban wild of Sydney's Eastern Suburbs staying connected to the natural world through surf and travel, and returned to the 'woods' later in life. After becoming a primary school teacher he discovered the world of nature connection and spent a year with WildWise and Schumacher College in the UK, fostering the arts of connection facilitation through many means including earth skills, play, story and imagination. Returning home he has spent the last 3 years roaming from course to course and place to place to deepen his learning and skills. 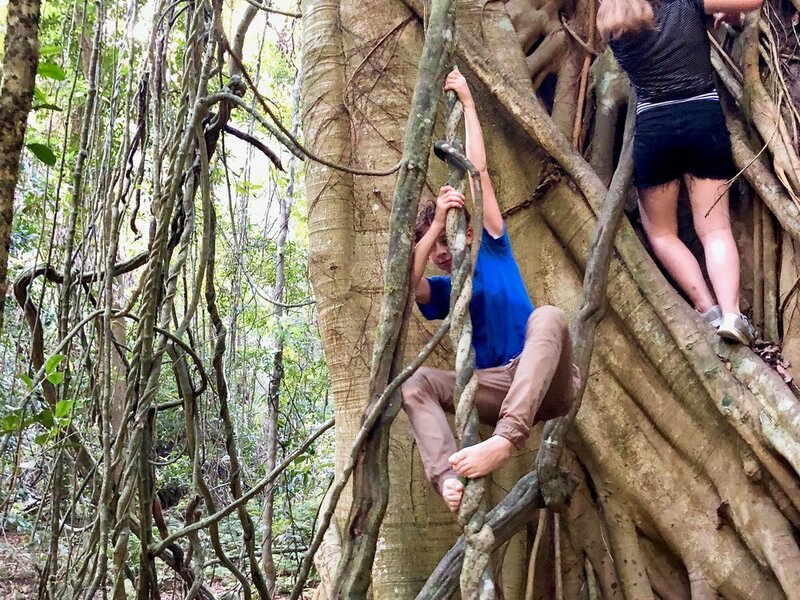 He spent time with Nature Philosophy, Bluegum Bushcraft, Claire Dunne and Wildcraft Australia (with Nikki), as well as making an annual immersion trip to Arnhem Land to better understand village culture and earth connection. He has been supporting and facilitating camps with these groups for the last three years and began his own business Wild by Nature Australia which focuses on co-creating wild village culture for kids, families and adults with an emphasis on wild adventure, play, story and skills. Meals - Monday nights meal will be ready on arrival. All other meals will be prepared by the village using the food provided. Cooking together brings a village together. Daily activities - Nature connection, bush skills and child friendly activities will be on offer in the mornings. After lunch there is an opportunity to explore, rest, play volleyball, climb on the jungle gym, run your own activity or workshop or whatever else you feel to do. The evenings will involve a shared meal and storytelling, music and a night challenge on one or two nights. Accommodation - The Lodge, built by hand of mud bricks, has 10 bunk style rooms with 2, 4 or 6 beds in each and one cottage. Families can book a room or individuals can book a bed. There is also the option to set up a tent. Transport - There is excellent public train transport from Sydney (Central Station) via Newcastle to Dungog. Cityrail and Trainlink. We can pick you up from Dungog Station, and bring you to Wangat Lodge (20 minutes). Otherwise it is a 3.5 hour drive north from Sydney – or 4.5 hours from the conference. A wild day for kids at Wangat Lodge to coincide with the Dungog Ultra Trail. Kids will be collected pre-race (7.30am) and will stay to cheer the runners on their way before heading to Wangat Lodge for a fun-packed, nature activity day! Kids return to Dungog at 4pm. Focus on your race and enjoy the day knowing your kids are having a great day too! Facilitated by experienced guides, activities will explore the beautiful rainforest, rivers and creeks of Wangat and its surrounds and teach children about the natural environment and bush crafts whilst having a lot of fun! *Discounted price available to siblings and those staying at Wangat and/or joining us for dinner. PLUS! Pizza and pasta and a yummy dessert available at Wangat on Saturday evening. Vegetarian and sustainable meat options. Other dietary requirements accommodated with prior notice.